1861, 24¢ dark violet, First Design, o.g., lightly hinged, rich deep dark violet shade enhancing a crisp detailed impression, well centered for this difficult issue, Very Fine; with 2012 P.F. certificate. 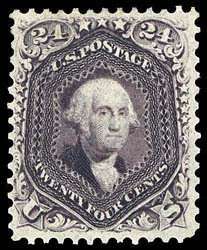 A CHOICE ORIGINAL GUM EXAMPLE OF THE 1861 24¢ FIRST DESIGN ISSUE. 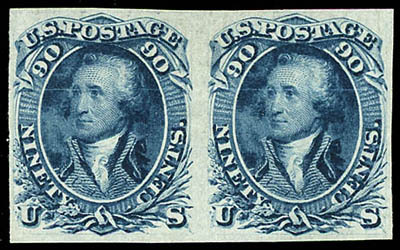 1861, 90¢ dull blue, First Design, imperf, margins clear to mostly large, rich deep color on bright paper, Very Fine, Scott catalog value for half of a pair; with 2011 P.F. certificate. 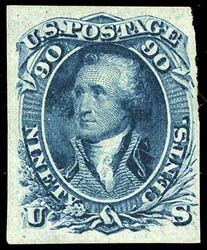 1861, 90¢ dull blue, First Design, imperf, horizontal pair, without gum, ample margins, deep bold color, horizontal crease, Very Fine appearance; with 1967 P.F. certificate.